1931, New York City: Detective Vic Boyo may not be the brightest bulb in the chandelier, but that doesn't stop him from solving cases as only he can. 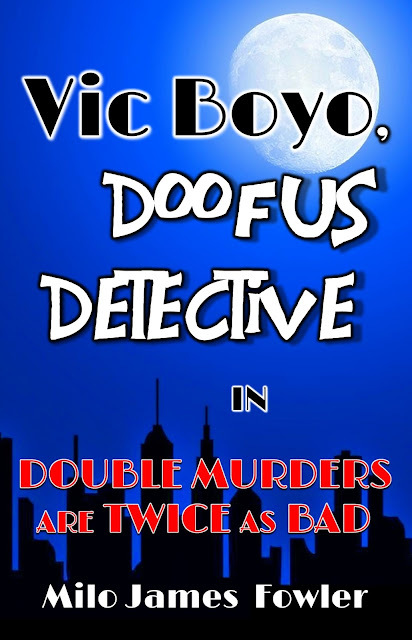 With a little luck and a whole lot of gumption, Boyo sets out to find the murderer of a local cop. Problem is, Boyo's more interested in a gorgeous femme fatale accused of killing her husband. She's destined for the electric chair, but Boyo's got a hunch she might be innocent. And nobody gets in the way of Boyo's hunches, not even Vic Boyo himself. Thanks for all the pageviews, likes, retweets, and nominations during my Kindle Scout campaign. It was an interesting experience. I went into it with no delusions that Vic Boyo would be selected. After being rejected by more than 100 agents and publishers who seemed to think there's no market for screwball detective novels, ol' Vic was fighting an uphill battle. But Kindle Scout campaigns are a free way to increase visibility for new releases, and I'm all about free when it comes to promoting my work. At the end of the 30-day campaign, close to two thousand readers had checked out my novel, and as soon as I received word that it wasn't selected, I had it ready for purchase on Amazon. The Kindle Scout folks then notified everyone who'd nominated it that Vic Boyo was now available. It'll be in the Kindle Unlimited program until June, at which point I'll distribute it via the other usual suspects: iBooks, Kobo, Nook, etc. The paperback turned out great, and it's available from both Amazon and Barnes & Noble. The audiobook is currently in production, and it should be available in early June. I've got a couple dozen reviewers lined up, and I'm curious to see what they think of Boyo's shenanigans. It was eye-opening lurking around the KindleBoards during my campaign and reading about authors spending hundreds of dollars on advertising, racking up thousands upon thousands of pageviews, only to be rejected by the Kindle Scout review team in the end. Vic Boyo may have never stood a chance, but now hundreds of potential readers know his name, and if they're curious, they can find out just how much of a doofus he really is.